Telford Balagokulam had a great opportunity to showcase themselves at the Golden Jubilee celebrations of the formation of Telford city on July 15th 2018. The Carnival parade was filled with lively and colourful representations from various cultures and charities. It was a proud moment for Telford Balagokulam as the enthusiastic kids dressed up as Hindu Bhagwans such as Radha, Krishna, Vishnu and Hanuman, they led the Hindu Cultural Resource Center in the Carnival Parade in front of 20,000 residents who filled the streets of the town watching the Parade. Many thanks to Nishaji from Radhe Krishna BG, Solihull for providing props. 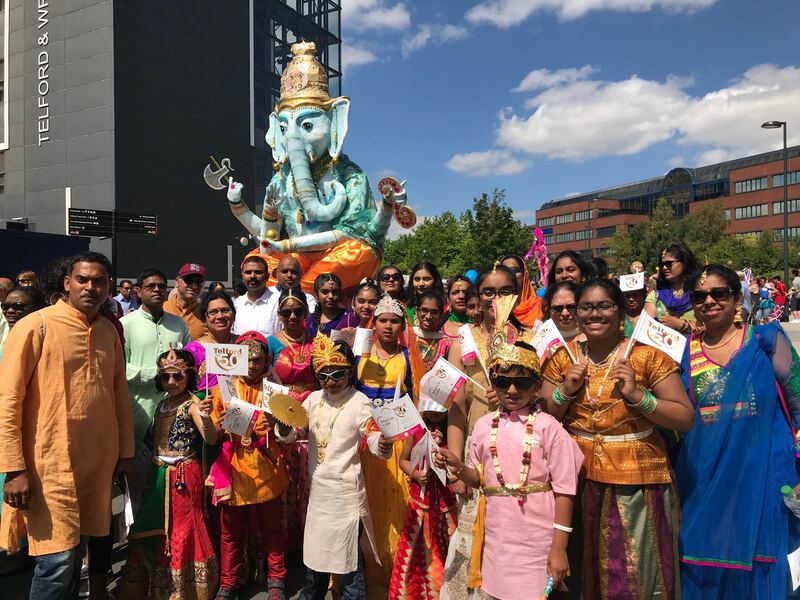 The parents and members of Balagokulam joined and doubled up the joy of representing the Hindu Culture and tradition by walking in the Carnival parade along with a Huge Ganesha Murthi. The streets of Telford town center were echoing the bhajans and praises of Lord Ganesha. The fun continued as the Carnival reached the Arena and the Balika members performed classical Bharatanatyam and semi classical dances. The younger members raised the enthusiasm of the crowd with an energetic Bollywood dance performance. Balagokulam Yuva members supported the spirit with semi classical dance and Bhangra dance. Volunteers of Balagokulam were interviewed by BBC Radio. The event and Hindu culture representation was covered in various media channels. It was a great day in Telford!